3/22/15 Our departure from Half Moon Bay is timed to minimize the negative impact of current as we enter the San Francisco Bay channel and cross the San Francisco Bar. At the narrowest point the channel is just under a mile wide. Today's current prediction is up to 4 knots at the morning peak. As a flood current (inbound) not a big problem if nothing goes wrong. Running is this type of current shortens the time a captain has to overcome a stalled engine or other issue. Running against this much current in our boat = less than 4 knots of speed over ground and the same issues on recovering from a problem. In the SF Bay an ebb (out bound) current is usually met by wind from the opposite direction. This can result in very steep and "square" waves. Even at 3-5 feet these waves are uncomfortable and can be dangerous. We enjoyed a smooth ride under the Golden Gate but we were a little later than planned. We saw plenty of flood current as seen below in the SOG (Speed Over Ground) reading from GPS. This is a speed record for WORKNOT. Entering SF Bay under the Golden Gate. Our first entrance to SF Bay (below) was on our 42' Grand Banks 3-11-2003. Its still a thrill! 32.4 knots with no help from the current! Burning about the same amount of fuel in about 2 or 3 minutes that we burn in a hour. Anchoring in Clipper Cove, just off of Treasure Island was a familiar scene. 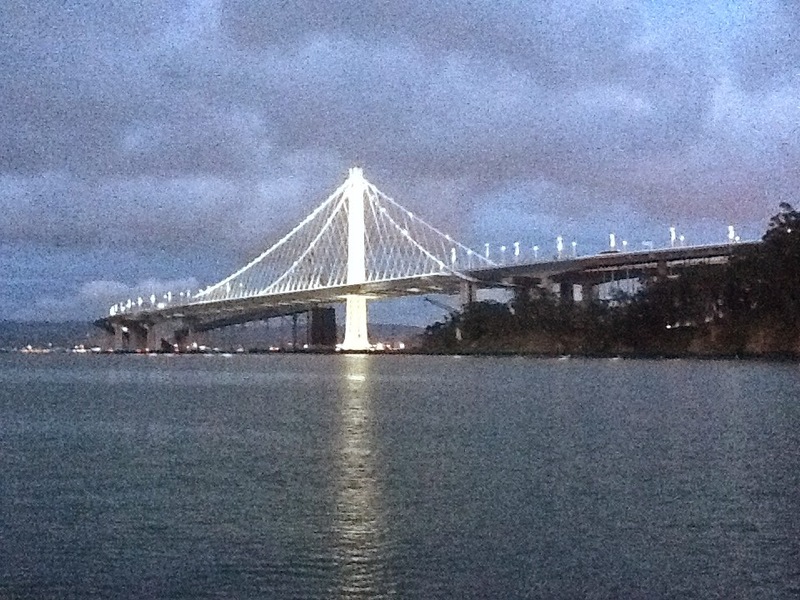 Over the years we spend many days and nights here watching the new Oakland Bay bridge being built. Now the old bridge is being taken down. You can see some of it in the background. The lighting at night is amazing. A real engineering accomplishment. Completed at 4 times the original engineering estimate it truly is stunning from the water. Heading up the Oakland Estuary the next morning we passed the Port of Oakland on our way to a guest slip at Marina Village. Plan to stay here in Alameda, visit some friends, make a run to Las Vegas for routine doctor visits and wait for a weather window to continue north. 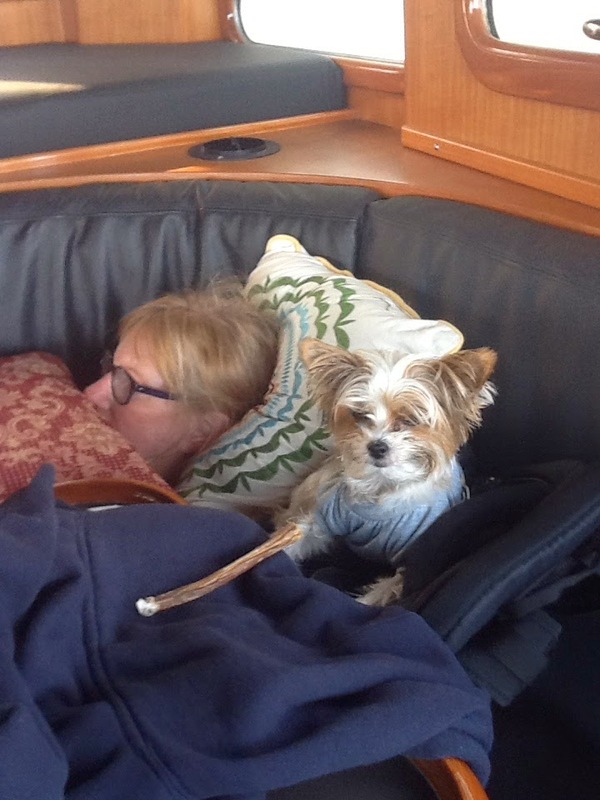 The crew is taking the opportunity to rest up for the trip north.